In architecture the capital (from the Latin caput, or "head") or chapiter forms the topmost member of a column (or a pilaster). It mediates between the column and the load thrusting down upon it, broadening the area of the column's supporting surface. The capital, projecting on each side as it rises to support the abacus, joins the usually square abacus and the usually circular shaft of the column. The capital may be convex, as in the Doric order; concave, as in the inverted bell of the Corinthian order; or scrolling out, as in the Ionic order. These form the three principal types on which all capitals in the classical tradition are based. The Composite order (illustration, right), established in the 16th century on a hint from the Arch of Titus, adds Ionic volutes to Corinthian acanthus leaves. From the highly visible position it occupies in all colonnaded monumental buildings, the capital is often selected for ornamentation; and is often the clearest indicator of the architectural order. The treatment of its detail may be an indication of the building's date. The two earliest Egyptian capitals of importance are those based on the lotus and papyrus plants respectively, and these, with the palm tree capital, were the chief types employed by the Egyptians, until under the Ptolemies in the 3rd to 1st centuries BC, various other river plants were also employed, and the conventional lotus capital went through various modifications. Many motifs of Egyptian ornamentation are symbolic, such as the scarab, or sacred beetle, the solar disk, and the vulture. Other common motifs include palm leaves, the papyrus plant, and the buds and flowers of the lotus. Some of the most popular types of capitals were the Hathor, lotus, papyrus and Egyptian composite. Most of the types are based on vegetal motifs. Capitals of some columns were painted in bright colors. Some kind of volute capital is shown in the Assyrian bas-reliefs, but no Assyrian capital has ever been found; the enriched bases exhibited in the British Museum were initially misinterpreted as capitals. In the Achaemenid Persian capital the brackets are carved with two heavily decorated back-to-back animals projecting right and left to support the architrave; on their backs they carry other brackets at right angles to support the cross timbers. The bull is the most common, but there are also lions and griffins. The capital extends below for further than in most other styles, with decoration drawn from the many cultures that the Persian Empire conquered including Egypt, Babylon, and Lydia. There are double volutes at the top and, inverted, bottom of a long plain fluted section which is square, although the shaft of the column is round, and also fluted. The earliest Aegean capital is that shown in the frescoes at Knossos in Crete (1600 BC); it was of the convex type, probably moulded in stucco. Capitals of the second, concave type, include the richly carved examples of the columns flanking the Tomb of Agamemnon in Mycenae (c. 1100 BC): they are carved with a chevron device, and with a concave apophyge on which the buds of some flowers are sculpted. The orders, structural systems for organising component parts, played a crucial role in the Greeks' search for perfection of ratio and proportion. The Doric capital is the simplest of the five Classical orders: it consists of the abacus above an ovolo molding, with an astragal collar set below. It was developed in the lands occupied by the Dorians, one of the two principal divisions of the Greek race. It became the preferred style of the Greek mianland and the western colonies (southern Italy and Sicily). In the Temple of Apollo, Syracuse (c. 700 BC), the echinus moulding has become a more definite form: this in the Parthenon reaches its culmination, where the convexity is at the top and bottom with a delicate uniting curve. The sloping side of the echinus becomes flatter in the later examples, and in the Colosseum at Rome forms a quarter round (see Doric order). In versions where the frieze and other elements are simpler the same form of capital is described as being in the Tuscan order. Doric reached its peak in the mid-5th century BC, and was one of the orders accepted by the Romans. Its characteristics are masculinity, strength and solidity. The Doric capital consists of a cushion-like convex moulding known as an echinus, and a square slab termed an abacus. In the Ionic capital, spirally coiled volutes are inserted between the abacus and the ovolo. This order appears to have been developed contemporaneously with the Doric, though it did not come into common usage and take its final shape until the mid-5th century BC. The style prevailed in Ionian lands, centred on the coast of Asia Minor and Aegean islands. The order's form was far less set than the Doric, with local variations persisting for many decades. In the Ionic capitals of the archaic Temple of Artemis at Ephesus (560 BC) the width of the abacus is twice that of its depth, consequently the earliest Ionic capital known was virtually a bracket capital. A century later, in the temple on the Ilissus, the abacus has become square (See the more complete discussion at Ionic order). Acording to the Roman architect Vitruvius, the Ionic order's main characteristics were beauty, femininity, and slenderness, derived from its basis on the proportion of a woman. The volutes of an Ionic capital rest on an echinus, almost invariably carved with egg-and-dart. Above the scrolls was an abacus, more shallow than that in Doric examples, and again ornamented with egg-and-dart. It has been suggested that the foliage of the Greek Corinthian capital was based on the Acanthus spinosus, that of the Roman on the Acanthus mollis. Not all architectural foliage is as realistic as Isaac Ware's (illustration, right) however. The leaves are generally carved in two "ranks" or bands, like one leafy cup set within another. One of the most beautiful Corinthian capitals is that from the Tholos of Epidaurus (400 BC); it illustrates the transition between the earlier Greek capital, as at Bassae, and the Roman version that Renaissance and modern architects inherited and refined (See the more complete discussion at Corinthian order). In Roman architectural practice, capitals are briefly treated in their proper context among the detailing proper to each of the "Orders", in the only complete architectural textbook to have survived from classical times, the Ten Books on Architecture, by Marcus Vitruvius Pollio, better known just as Vitruvius, dedicated to the emperor Augustus. The various orders are discussed in Vitruvius' books iii and iv. Vitruvius describes Roman practice in a practical fashion. He gives some tales about the invention of each of the Orders, but he does not give a hard and fast set of canonical rules for the execution of capitals. Two further, specifically Roman orders of architecture have their characteristic capitals, the sturdy and primitive Tuscan capitals, typically used in military buildings, similar to Greek Doric, but with fewer small moldings in its profile, and the invented Composite capitals not even mentioned by Vitruvius, which combined Ionic volutes and Corinthian acanthus capitals, in an order that was otherwise quite similar in proportions to the Corinthian, itself an order that Romans employed much more often than Greeks. The increasing adoption of composite capitals signalled a trend towards freer, more inventive (and often more coarsely carved) capitals in Late Antiquity. The anta capital is not a capital which is set on top of column, but rather on top of an anta, a structural post integrated to the frontal end of a wall, such as the front of the side wall of a temple. The top of an anta is often highly decorated, usually with bands of floral motifs. The designs often respond to an order of columns, but usually with a different set of design principles. In order not to protrude excessively from the wall surface, these structures tend to have a rather flat surface, forming brick-shaped capitals, called "anta capitals". Anta capitals are known from the time of the Doric order. An anta capital can sometimes be qualified as a "sofa" capital or a "sofa anta capital" when the sides of the capital broaden upward, in a shape reminiscent of a couch or sofa. Anta capitals are sometimes hard to distinguish from pilaster capitals, which are rather decorative, and do not have the same structural role as anta capitals. The origins of the Tuscan order lie with the Etruscans and are found on their tombs. Although the Romans perceived it as especially Italianate, the Tuscan order found on Roman monuments is in fact closer to the Greek Doric order than to Etruscan examples, its capital being nearby identical with the Doric. The Romans invented the Composite order by uniting the Corinthian order with the Ionic capital, possibly as early as Augustus's reign. In many versions the composite order volutes are larger, however, and there is generally some ornament placed centrally between the volutes. Despite this origin, very many Composite capitals in fact treat the two volutes as different elements, each springing from one side of their leafy base. In this, and in having a separate ornament between them, they resemble the Archaic Greek Aeolic order, though this seems not to have been the route of their development in early Imperial Rome. Equally, where the Greek Ionic volute is usually shown from the side as a single unit of unchanged width between the front and back of the column, the Composite volutes are normally treated as four different thinner units, one at each corner of the capital, projecting at some 45° to the facade. Some capitals with strong Greek and Persian influence have been found in northeastern India in the Maurya Empire palace of Pataliputra, dating to the 4th–3rd century BC. 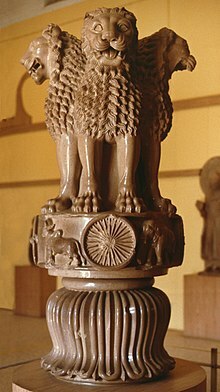 Examples such as the Pataliputra capital belong to the Ionic order rather than the later Corinthian order. They are witness to relations between India and the West from that early time. Indo-Corinthian capitals correspond to the much more abundant Corinthian-style capitals crowning columns or pilasters, which can be found in the northwestern Indian subcontinent, particularly in Gandhara, and usually combine Hellenistic and Indian elements. These capitals are typically dated to the first century BC, and constitute important elements of Greco-Buddhist art. The Classical design was often adapted, usually taking a more elongated form, and sometimes being combined with scrolls, generally within the context of Buddhist stupas and temples. Indo-Corinthian capitals also incorporated figures of the Buddha or Bodhisattvas, usually as central figures surrounded by, and often under the shade of, the luxurious foliage of Corinthian designs. The Pataliputra capital is a monumental rectangular capital with volutes and Classical Greek designs, that was discovered in the palace ruins of the ancient Mauryan Empire capital city of Pataliputra (modern Patna, northeastern India). It is dated to the 3rd century BC. The top is made of a band of rosettes, eleven in total for the fronts and four for the sides. Below that is a band of bead and reel pattern, then under it a band of waves, generally right-to-left, except for the back where they are left-to-right. Further below is a band of egg-and-dart pattern, with eleven "tongues" or "eggs" on the front, and only seven on the back. Below appears the main motif, a flame palmette, growing among pebbles. Byzantine capitals are very varied, mostly developing from the classical Corinthian, but tending to have an even surface level, with the ornamention undercut with drills. The block of stone was left rough as it came from the quarry, and the sculptor evolved new designs to his own fancy, so that one rarely meets with many repetitions of the same design. One of the most remarkable designs features leaves carved as if blown by the wind; the finest example being at the 8th-century Hagia Sophia (Thessaloniki). Those in the Cathedral of Saint Mark, Venice (1071) specially attracted John Ruskin's fancy. Others appear in Sant'Apollinare in Classe, Ravenna (549). The capital in San Vitale, Ravenna (547) shows above it the dosseret required to carry the arch, the springing of which was much wider than the abacus of the capital. On eastern capitals the eagle, the lion and the lamb are occasionally carved, but treated conventionally. There are two types of capitals used at Hagia Sofia: composite and ionic. The composite capital that emerged during the Late Byzantine Empire, mainly in Rome, combines the Corinthian with the Ionic. Composite capitals line the principal space of the nave. Ionic capitals are used behind them in the side spaces, in a mirror position relative to the Corinthian or composite orders (as was their fate well into the 19th century, when buildings were designed for the first time with a monumental Ionic order). At Hagia Sofia, though, these are not the standard imperial statements. The capitals are filled with foliage in all sorts of variations. In some, the small, lush leaves appear to be caught up in the spinning of the scrolls – clearly, a different, nonclassical sensibility has taken over the design. The capitals at Basilica of Saint Vitale in Ravenna (Italy) show wavy and delicate floral patterns similar to decorations found on belt buckles and dagger blades. Their inverted pyramidal form has the look of a basket. In both periods small columns are often used close together in groups, often around a pier that is in effect a single larger column, or running along a wall surface. The structural importance of the individual column is thereby greatly reduced. In both periods, though there are common types, the sense of a strict order with rules was not maintained, and when the budget allowed, carvers were able to indulge their inventiveness. Capitals were sometimes used to hold depictions of figures and narrative scenes, especially in the Romanesque. In Romanesque architecture and Gothic architecture capitals throughout western Europe present as much variety as in the East, and for the same reason, that the sculptor evolved his design in accordance with the block he was carving, but in the west variety goes further, because of the clustering of columns and piers. The earliest type of capital in Lombardy and Germany is known as the cushion-cap, in which the lower portion of the cube block has been cut away to meet the circular shaft. These types were generally painted at first with geometrical designs, afterwards carved. The finest carving comes from France, especially from the area around Paris. The most varied were carved in 1130–1170. In Britain and France the figures introduced into the capitals are sometimes full of character. These capitals, however, are not equal to those of the Early English Gothic, in which foliage is treated as if copied from metalwork, and is of infinite variety, being found in small village churches as well as in cathedrals. In the Renaissance period the feature became of the greatest importance and its variety almost as great as in the Romanesque and Gothic styles. The flat pilaster, which was employed extensively in this period, called for a planar rendition of the capital, executed in high relief. This affected the designs of capitals. A traditional 15th-century variant of the Composite capital turns the volutes inwards above stiffened leaf carving. In new Renaissance combinations in capital designs most of the ornament can be traced to Classical Roman sources. The 'Renaissance' was as much a reinterpretation as a revival of Classical norms. For example, the volutes of ancient Greek and Roman Ionic capitals had lain in the same plane as the architrave above them. This had created an awkward transition at the corner – where, for example, the designer of the temple of Athena Nike on the Acropolis in Athens had brought the outside volute of the end capitals forward at a 45-degree angle. This problem was more satisfactorily solved by the 16th-century architect Sebastiano Serlio, who angled outwards all volutes of his Ionic capitals. Since then use of antique Ionic capitals, instead of Serlio's version, has lent an archaic air to the entire context, as in Greek Revival. "These capitals during the summer session obtained me more applause from members of Congress than all the works of magnitude or difficulty that surround them. They christened them the 'corncob capitals'." Another example is the Delhi Order invented by the British architect Edwin Lutyens for New Delhi's central palace, Viceroy's House, now the Presidential residence Rashtrapati Bhavan, using elements of Indian architecture, Here the capital had a band of vertical ridges, with bells hanging at each corner as a replacement for volutes. The Delhi Order reappears in some later Lutyens buildings including Campion Hall, Oxford. ^ John James, The Creation of Gothic Architecture – an Illustrated Thesaurus: The Ark of God, vols. 5, London and Hartley Vale, 2002/2008. ^ Gradidge, Roderick (1981). Edwin Lutyens: Architect Laureate. London: George Allen and Unwin. p. 69. ISBN 0-04-720023-5. ^ Gradidge, Roderick (1981). Edwin Lutyens: Architect Laureate. London: George Allen and Unwin. p. 151. ISBN 0-04-720023-5. This article incorporates text from a publication now in the public domain: Chisholm, Hugh, ed. (1911). "Capital (architecture)" . Encyclopædia Britannica (11th ed.). Cambridge University Press. This page is based on the Wikipedia article Capital (architecture); it is used under the Creative Commons Attribution-ShareAlike 3.0 Unported License (CC-BY-SA). You may redistribute it, verbatim or modified, providing that you comply with the terms of the CC-BY-SA.